Mess with the bull...Get the horns. 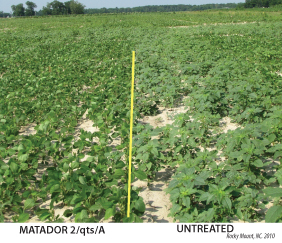 MATADOR is a soybean pre-emerge herbicide chemistry that contains three different active ingredients - metolachlor, metribuzin and imazethapyr - to help control grass and broadleaf weeds. This unique formulation was designed to be a resistant weed managment tool to combat glyphosate and ALS resistant weeds. "Mess With the Bull, Get the Horns"